As the press release states, this is jazz music inspired by the likes of Ornette Coleman, Eric Dolphy, Mingus and the Art Ensemble of Chicago. I guess that looks like a tall order to fill, but Aram Shelton doesn't fail you one second on this excellent release. It's also - for those interested (like me) - the second album from the 4tet on Shelton's Singlespeedmusic label. 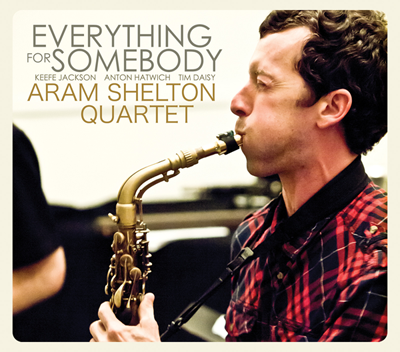 Everything for Somebody is one of those albums like much of the music coming out of the Chicago scene, a mixture of free and composed jazz. Although Shelton isn't based in Chicago he seems to have put together this group from his earlier residency there. Members Keefe Jackson (tenor sax), Anton Hatwich (bass) and the most recent addition Tim Daisy (drums) .. a name that shouldn't need any introduction! One could try and get philosophical about this music, but somehow there doesn't seem to be any need as it's music that touches the listener right from the opening notes. 'Anticipation' which dances away on a simple joyful swinging melody leaves space for the two major soloists of Jackson and Shelton to blow simple melodic improvisations. The dancing melody starts as an easily memorable melody but the two soloists dig deep helping to yield hidden secrets gradually, balancing a fine line between free-bop and more dense melodic improvisation. It's this 'fine line' that carries itself through the record, and for me makes this not only highly listenable, but also a refreshing breath of air. The opening sounds of 'Everything for Somebody' almost takes you back to hearing Ornette for the first time with his famous quartet, although here it's two saxes. Keefe Jackson blows some powerful free-bop lines that really hang together in the same way the Dewey Redman managed. Aram Shelton seems to play some serious lines on this tune which are a marvel to behold, floating over the swinging bass and drums like a butterfly in the wind. The energy of the the whole group never lets up for one minute, holding your attention throughout. All the tunes on this release are very strong, adventurous in style and thinking, they ultimately carry the musicians to areas where they can find new ideas. 'Joints and Tendons' really explores sound textures for all the group, setting up each member in a duo context whilst cleverly weaving in melodic fragments. 'Deadfall' is a mournful cry for the solo alto of Shelton cueing in the group (several minutes into the piece) into a gorgeous arpeggiated melody. The rest of the band grab this and gradually build into a wailing free-for-all before finding their way back to the serenity of the initial melody. 'Fleeting', the final track treats us to some fine free flowing ideas from the whole band with solos from all and a wonderful Ornette-esque melody to sandwich the ideas. Another fine album from Aram Shelton who seems (from what I've seen) to be a very interesting voice in the world between improvised music and free jazz. His wonderful Arrive albums (*), electro acoustic experiments, Cylinder and other such projects go to show that Shelton is constantly looking for new avenues of experimentation. A highly recommended album for those who enjoy the meeting of swing and free jazz. Some tags could be - Ornette Coleman, Atomic, Motif, The Engines, Vandermark 5 ... if you see what I mean! *= There's a first Arrive album is on Singlespeedmusic. Great review, and exciting news about the new release. Thanks, it's - indeed - a very nice album, and I hope to check out more of Aram's music in the future. Thanks Anon, indeed for anybody interested the Singlespeed Soundcloud page has lots of goodies from Aram and various other groups that he's working with.